George Bernard Shaw said of Verdi's Il Trovatore 'He who thinks that Il Trovatore can be performed without taking it with the most tragic solemnity is, for all the purposes of romantic art, a fool…'. The opera is frequently and freely criticized, mostly for the libretto which many find risible, but also for some musical moments which appear, if one neglects to consider all the elements required for a successful piece of lyric theatre, crass. Thankfully, Carlo Maria Giulini appears to have shared Shaw's sentiments about the work, and the performance released by the Royal Opera House Heritage Series, given on 26 November 1964, is near ideal from the point of view of the conducting. Giulini brings a marvelous sense of rhythmic precision to the score with excellently judged tempi and carefully balanced dynamics which serve Verdi and the cast very well. There is an inevitability about the progression from one scene to the next which is difficult to achieve in what people think of as a 'number opera', and Shaw's 'tragic solemnity' is indeed the best way to describe the mood which prevails as one moves inexorably towards the dreadful dénouement. 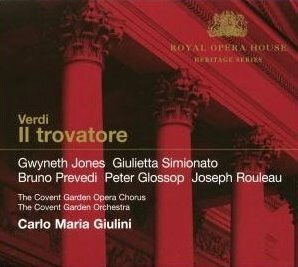 Giulini keeps a tight rein, so that tension is increased and sustained, but matters never become frantic as is so often the case in performances of Trovatore, for instance in the Act I trio between Il Conte di Luna, Leonora and Manrico. It is a tremendous credit to the Orchestra of the Royal Opera House that they have the skill to deliver all the detail that Giulini demands with startling accuracy and spirit. Vocally, the performances are for the most part very strong without being the unqualified success that would make this a 5 star recording. The premiere of this Trovatore has been famous for a long time as the occasion on which the great Welsh dramatic soprano, Dame Gwyneth Jones, achieved major prominence, substituting for the originally announced Leontyne Price at short notice. Alan Blyth, in his liner notes which accompany this release, describes Jones as being 'at her absolute peak at this stage of her career'. This seems a little unfair, as she wasn't so long out of music college, and had a further thirty or so years of major international success ahead of her. It is true, however, that vocally she is an absolute paragon of Italianate style, which did not remain the case for her whole career, and her vibrato is far less noticeable than it became even ten years later. Those with an aversion to Jones's less reliable singing in later years will be pleasantly surprised to hear the ease, security and sheer beauty of sound on display here – indeed, she had much in common with Price at this point of her career. Unfortunately though, she is also far less dramatically involving than one has come to expect from her, or than one would like from a great Leonora. One cannot fail to be impressed by the singing, but one is not swept away by the passion that ought to be on display from this heroine in extremis. The opposite is the case with the Azucena on this recording, Giulietta Simionato, who had been on the operatic stage for over 30 years by 1964, and who retired just 2 years later in 1966. Azucena had been something of a signature role for Simionato, and her experience shows in her enthralling interpretation, but the voice itself sounds a little thin and lacks the lustre and squillo present in earlier years, such as her Giovanna opposite Gencer in the Anna Bolena broadcast of 1958. One suspects that live in the theatre, the signs of age in Simionato's vocal estate may have mattered less, but the role is absolutely pivotal and carries several large scenes in the opera, so for the listener at home, the lack of facility and bloom in the voice makes her portrayal a little unrewarding. As has been remarked by more than one commentator, if a singer like Bruno Prevedi, who sings Manrico, emerged today, he would instantly be fast-tracked to the top rank of international opera singers. In an age where Corelli, Del Monaco, Bergonzi, Di Stefano, Pavarotti and Domingo were active, Prevedi was thought of as nothing terribly special. His voice had a beautiful colour, he was very involved dramatically and he was absolutely on top of all the considerable challenges presented by the role of Manrico. Here, he gives a beautifully phrased account of 'Ah! sì, ben mio' followed by a muscular and idiomatic 'Di quella pira', qualities which he also brings to all his duets and ensembles. Peter Glossop is a reliable and high quality Conte di Luna who inspires Jones to a greater level of involvement in their Act IV duet than she displays elsewhere during the opera. All the small roles are sufficiently stylish and well sung. There are some standard cuts, such as the second verse of 'Di quella pira', but there is also the welcome inclusion of Leonora's 'Tu vedrai' which has often been omitted in performances of the work. The sound is as good as one can reasonably expect, and stage noise is at a minimum. 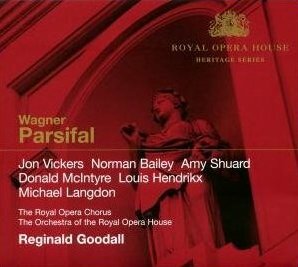 With a running time of almost 4 hours and 45 minutes, this new release of Wagner's Parsifal, given on 8 May 1971, is over an hour longer than 2 other live recordings I have to hand, and is indeed one of the longest on record. Upon listening to the Act I Prelude, the number of glaringly obvious split notes from the brass can't help but make one feel a little pang of pity for the audience, knowing they were in for a very long night. But if Reginald Goodall's quest for an ethereal quiet and stasis made his orchestra tense to start with, by the end of the prelude everybody appears to have settled into the part they have to play in realising Goodall's vision, and a certain understated orchestral sumptuousness from everybody, including the brass, quickly becomes one of the defining characteristics of this performance. Although an essay in the liner notes that accompany the release, written by John Deathridge, says that 'it is still difficult to imagine [Wagner] approving of Goodall's first act, which is surely much too long, and indeed constantly verges on incoherence', I found that one gets used to the unusually slow tempi fairly quickly, and accepts them, an experience familiar from many of Otto Klemperer's recordings. Wagner's music is of course immensely difficult to sing from many points of view, but one thing it does tend to have is an abundance of places to breathe, which means the slow tempi do not necessarily pose the singers with the problems that might arise were they to be faced with the same situation in Mozart or Verdi. The musical environment created by Goodall therefore allows his artists to create immensely detailed characterisations, which suits this cast particularly well. As Gurnemanz, the Belgian bass Louis Hendrikx brings a beautiful voice, magnificent, elegant gravitas, and something akin to a Lieder singer's attention to text, although it is interesting to note that Hendrikx in fact sang very few Lieder during his career. His operatic debut came as late as 1963, but he quickly made Wagner the cornerstone of his repertoire and his experience with the role shows in this brilliantly nuanced performance. Amy Shuard, one of Covent Garden's post-war resident dramatic sopranos who deserves to be better remembered than she is, presents a Kundry of fascinating depths. The voice is perhaps not as immediately seductive or glamorous as some who have been acclaimed in the role, but she certainly delves into the character and phrases beautifully, rising to some thrilling climactic high notes in Act II. Like Shuard, the voice of Jon Vickers has been surpassed in terms of beauty by other interpreters of the title role, but Vickers really seems to get to the heart of the matter, as far as one can with Parsifal. Somehow, one always feels he is creating something very specific, be it during the character's sprawling introspection, active discourse or passionate outbursts. He is on excellent form in this performance in terms of pure vocal production, injecting more colour into his often rather dry timbre than elsewhere in his discography. Vickers is amongst those singers where one is told one had to experience the voice live in order to appreciate its greatness, but it is a credit to the quality and 'style' of the sound on this recording that the greatness somehow comes across. Such illustrious names as Norman Bailey, Michael Langdon and Donald McIntyre round out a cast of principals notable for being what one might call thinking man's singers. Of the smaller roles, the young Kiri Te Kanawa as the first flower maiden is in such lustrous, fresh voice that the impact is quite distracting, and the other five flower maidens suffer quite badly by comparison, although they do have more of a sense of style than their glamorous colleague. Te Kanawa certainly got noticed in contemporary reviews of the performances, and it is fascinating to have this document of her early years in the Covent Garden ensemble, just months ahead of her shooting to stardom as the Countess in Le Nozze di Figaro later in 1971. This Parsifal is not without its idiosyncrasies. Shuard lacks the refulgence of other Kundrys like Gwyneth Jones or Christa Ludwig, and there are Parsifals with more alluring voices, such as James King and Placido Domingo. But I have yet to hear a recording that continues to reveal so much on repeated listening. Vickers, in fairly typical self-congratulatory mode, said in his now famous interview with Brice Duffie 'I can assure you that the Parsifal at Covent Garden [is] talked about to this day' and the release of this recording will ensure that his assertion remains the case for a long time yet.